Besides providing food for the table, your chickens can do so much more to help improve your farm. Chickens are a popular choice of livestock for farmers of all sizes and scope to incorporate into their food landscape, and there are breeds for all purposes and budgets. Chickens can be employed for natural insect or weed control or to provide food for your household. Of the hundreds of species of chickens, you are bound to find one or more suited for your desired purpose. Plus, many are considered dual purpose birds and are suitable for any use. Chickens will gladly eat your weeds, pick off insects and fertilize and aerate your soil. Unlike other farm work animals, though, they aren’t herded easily and do not take direction well. To get them to focus on the area that you may want them to browse or work the soil, fence them in or make use of chicken tractors to move them around an area. This will ultimately protect them from predators while giving them a constant source of fresh pickings. Keep in mind though that chickens do not distinguish between good bugs and bad bugs or crops and weeds. Do not release them into areas with young or recently planted food plants or those bearing attractive fruit. If you’re trying to increase your population of worms, do not allow your chickens into this area either. Chicken manure is a great fertilizer, but it needs to be composted, aged or worked into the soil well. It can burn plants if large quantities of fresh manure are applied directly as a soil amendment. Releasing a flock of chickens onto a patch of land that you wish to farm in the near future is a great way to sustainably revive it. Their pecking and scratching, along with their manuring, will add the needed life back into tired soil and make it suitable for planting again. 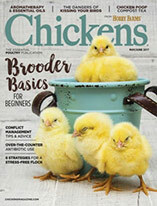 Many farmers like the idea of raising chickens for meat, as broiler chickens don’t take as long to mature to size as compared to other livestock. Depending on the breed, they may go from chick to harvest in about two months. This means that even a small farmer can have several generations and a near continual supply of meat birds over the course of the year without significant up-front investment. If choosing a heritage breed of chicken, it may take longer to mature to the weight required for harvest, but many consumers that care about the quality of their meats are willing to pay extra for eating a breed of bird that our ancestors raised. Some examples of meat breeds are Jersey Giants, Cornish Cross, Buckeyes and Chanteclers. 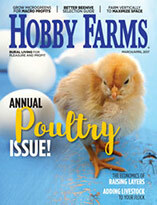 Raising chickens for eggs is the reason most often cited by small-scale hobby farmers. A healthy hen can lay several eggs per week and sometimes even one or more per day in her peak. They more than pay for themselves within the first year when considering the price of locally produced, cage-free eggs. In many markets, these eggs go for more than $5 per dozen. Even if your intent is not to sell the eggs, few who have ever tasted them would argue that there are any brighter yolks or tastier eggs than those laid by well-treated hens. All breeds of hens will lay eggs, but some are more prolific than others. 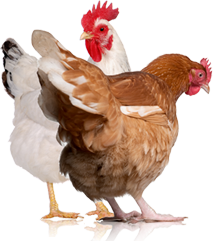 Common laying breeds include Rhode Island Reds, Buff Orpington, Plymouth, Partridge Rocks and other hybrids bred for egg production. Chickens can also be raised solely for breeding purposes. The chicks can be sold direct to consumers, or to farmers, garden centers or pet stores. Breeders may also raise chickens for show or to supply animals for educational purposes, such as county fairs, 4-H or the FFA. Common breeds for show include bantam breeds, Polish, Silkies and Cochins. These are known for their plumage or diminutive sizes—not necessarily for their egg-laying abilities or tasty meat. Regardless of breed, keep in mind that the role of roosters. Roosters are not required for egg production—only to produce fertilized eggs for breeding. Some municipalities will allow for the raising of hens but not roosters due to their tendency to crow loudly. Roosters are also more prone to show aggressive behaviors, especially when they don’t have room to roam. In settings where the chickens will be free-ranging, even if you are only raising chickens for their eggs, it may be advisable to have at least one rooster if your local zoning rules allow for it. They will be noisy, but they also will protect the flock from predators that may attempt to kill your chickens. The ratio of roosters to hens will vary depending on the purpose you are raising them, but in general, there should not be more than one rooster for every 10 hens. The males will be especially aggressive towards one another, and the dominant one will likely kill the other males. Like all other work animals or pets, chickens require daily care. It is imperative that they have access to fresh, clean water, enough food, and space to run around, roost and nest if you are raising layers. If they don’t have these things, they can become aggressive toward one another and, in some cases, kill and cannibalize one another. Also check specifics about the hardiness of breeds. Not all chickens can survive in all environments. Chickens that will do well in Maine may not be the best choice for Arizona.